The hardy perennial Armeria is also known by the names Sea Pink and Thrift. It normally flowers from spring to the middle of summer and is native to alpine meadows. Thrift is a dwarf evergreen that has small white or pink flowers. The Armeria plant itself is rosette like in nature, with stems bolting out, which carry the sphere shaped flowers. 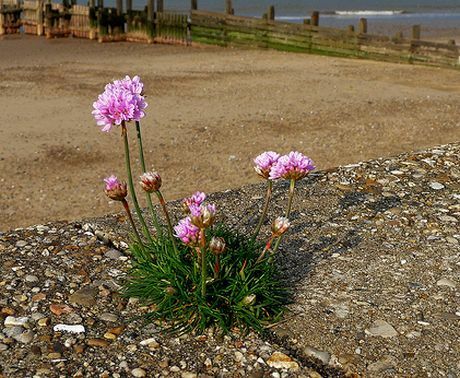 Thrift is a very salt tolerant plant and can therefore be grown at seaside locations, and it makes an ideal rockery plant wherever it is grown. Sea Pink by Colin-47 _Away. Common Names: Thrift, Sea Pink, Sea Cushion, Plantain Thrift. Height: 4 to 12 inches (10 to 30 cm). Flowers: Spring to Early Summer. Flower Details: Pink or white, Globes. Sow Outdoors: Cover seed. Early spring or start of autumn. Spacing 6 to 12 inches (15 to 30 cm) dependent upon species size. Sow Indoors: Soak seeds overnight in warm water. Germination time 10 to 20 days. Darkness. Temperature 60 to 70°F ( 15 to 21°C). Start 10 weeks before transplanting outdoors before the last frost or in autumn. Requirements: Full Sunlight. Good drainage. Soil pH 5.5 to 7.5. Sandy soils. Supply straw mulch in winter. Deadhead. Water in dry periods. 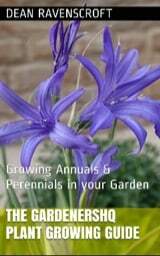 Propagate by taking cuttings or by division on spring. If you intend to sow Armeria seeds outdoors, they should be sowed on the surface and lightly covered with soil in the early spring or early autumn. If you prefer to grow seedlings indoor then seeds should be prepared about ten weeks before they are due to be put out (early spring). Seeds should first be imbibed by soaking in warm water for 8 hours, then grown in darkness at 16 to 21 degrees Celsius. The plants would normally have germinated after two to three weeks. When the seedlings are ready for transplanting they should be put out at a space of 15 cm for smaller species and 30 cm for larger types. They should be planted in a well drained, slightly sandy soil with a pH of between 5.5 and 7.5. 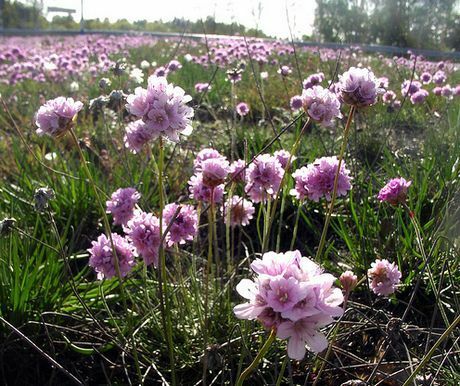 It is easy to look after Sea Pink, thrift, and other Armeria; they require a light watering in dry conditions, and should be deadheaded following flowering to prevent seed setting and the spread of thrift. Ideally Armeria should be lightly mulched for protection over the winter with straw.